After a burst of new openings and the rapid growth of the restaurant scene, the East Coast city pumps all year round with cool tapas spots, fresh seafood and casual café-style fare. This selection comprises all the Durban restaurants that made the cut for the 2019 Eat Out 500, the list of best restaurants in the country as rated and reviewed by our panel of critics for the 2019 edition of Eat Out magazine (on sale now). But we know the city is crammed with loads more gems and mainstays that didn’t crack the nod. Please tell us about your favourites in the comments at the end! Chef Khutso Nhlanhla Masethe’s idea is simple: Morroccan burgers on a panini bun. The simplicity of the idea and the total dedication to it makes the execution so gratifying. There’s a selection of beef, lamb and chicken burgers all topped with delicious coriander pesto, onion marmalade and hummus that make the taste buds sing. There’s also a chicken option, with succulent chicken breast nuggets. There’s falafel as a vegan option and the place is halaal certified. Sliders from D’Urban Burger Co. Photo supplied. 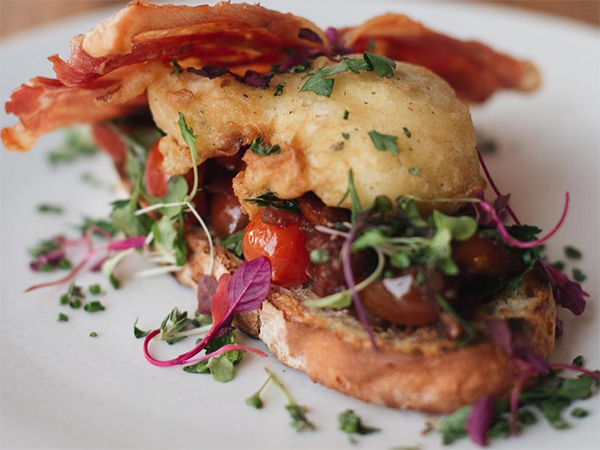 At this winner of Best Bistro in KwaZulu-Natal at the 2018 Best Everyday Eateries, dynamic husband-and-wife team Graham and Gina Neilson showcase a global menu that uses local flavours and ingredients. Start with the gorgonzola, pear and candied pecan salad or the fried calamari, tossed in sticky Vietnamese roasted jalapeño aïoli. A popular favourite is the creamy shellfish orzo. Main courses include lamb shoulder, crispy duck and braised beef short rib. Order the tasting menu for an experiential food journey. Desserts could include blueberry-ripple ice cream or their take on a G&T: gin-and-juniper sorbet with toasted marshmallow meringue, lemon curd and cucumber gelée. The focus is on local, seasonal and fresh produce, and the hearty dishes brim with comfort. Choose from starters such as the creamy Cape Malay mussel pot and peri-peri chicken livers. On the mains front, the oxtail in red wine is a go-to dish, as is the three-hour lamb shank with rosemary and red wine. For a taste from further afield, the Barbadian chicken – grilled chicken breast marinated in garlic, ginger and fresh red chilli, and served with avocado and pineapple salsa – is delicious. There are burgers, pasta and seafood, but also fresh, tasty salads, quesadillas, wraps and toasted sandwiches if you want to go light. For dessert, the molten chocolate pudding goes down well. The fuss-free menu is small but perfect for holiday dining. 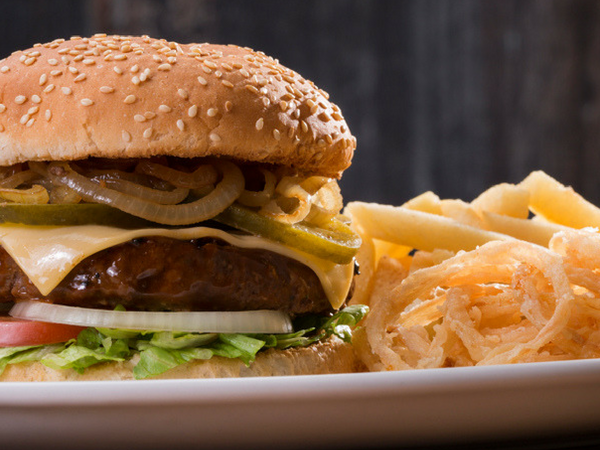 Think peri-peri chicken livers; chicken and beef burgers; snack baskets including various grilled and fried finger foods and chips; a chicken prego roll; steak, egg and chips; calamari or prawns; and a selection of salads. Beautifully presented on a large white dish, the seafood salad comes with a healthy dose of fair-sized prawns and calamari in a piquant French dressing. The peri-peri chicken prego roll is laced with garlic and peri-peri, with a generous portion of chips covering the balance of the plate. Breakfast is served all day and the waiters can provide information on gluten-free, vegan and banting options. The cinnamon-spiced hotcakes arrive with fresh banana, crème fraîche and honey; while the smoked salmon on sweet potato and quinoa cake delights the senses. Casual daytime meals include Thai calamari salad; roast butternut and beetroot salad topped with goat’s cheese, micro greens and pumpkin seeds; and a Mediterranean lamb burger topped with marinated roast tomato, red peppers and finished with salsa verde. Dinner mains include matured fillet and sirloin, braised Karoo lamb shank, and wild mushroom and baby spinach tagliatelle with goat’s cheese. Whether breakfast is Welsh rarebit with bacon and mushrooms or a freshly made bowl of crunchy honey granola, fruit and berries, St. Clements promises soul food in breathtaking tranquillity. The banana-and-blueberry French toast is mouth-watering. The traditional Moroccan chicken (or beef ) salad, served with greens and chickpeas, tantalises the taste buds with spicy harissa and hints of piquant lemon zest, while the dinner options – typically presented on whiteboards to maximise seasonality – speak to a love of Asian food with stir-fries and chilli-based dishes taking centre stage. This is Durban street food at its best – a simple, limited chicken-based menu made using good-quality ingredients. Breakfast options include a breakfast wrap with bacon, scrambled egg and chilli chutney, or the Regmaaker option of egg, streaky bacon, chicken strips, ‘tjips’, chicken livers and a toasted roll. 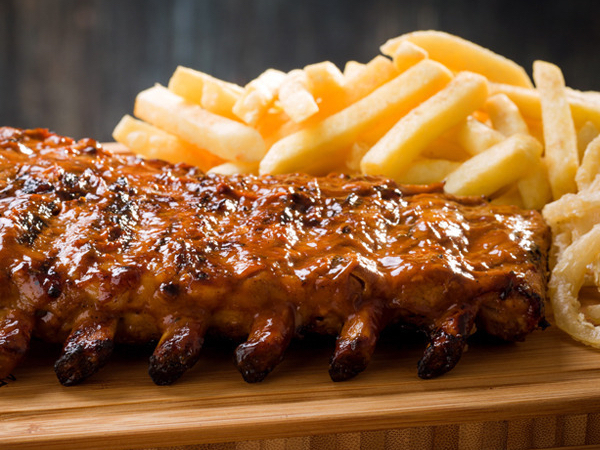 The grilled chicken strips (lightly dusted with flour and prepared on their flat top) and “tjips” (handcut, skin on chips) options range from the regular version to the ‘Kiff’ (with avo) and the ‘Laanie’ (with avo and bacon) – all served with lemon or chilli sauces. Also try the Shweet chicken burger with pineapple relish. Owned and managed by a lovely Muslim family, the café is fully halaal. Breakfast is served all day and options include the usual eggy suspects, with lamb rashers served instead of bacon, as well as a vegan breakfast or citrus fruit salad. The shakshuka is really good – poached eggs baked in a Middle-Eastern spicy tomato sauce. Light meals cater for a variety of tastes with generously filled wraps, crispy flatbreads and toasties. All are served with potato, sweet potato or zucchini fries. More substantial dishes include fillet, sirloin or T-bone, peri-peri prawns or Norwegian grilled salmon. Desserts are decadent and the malva pud is extremely moreish. Chef-patron Chris Black has a well-earned reputation for creating food magic. Breakfasts are on point, while lunch caters for the social crowd with salads like classic Caesar, or one with a sublime combination of chicken, brown rice, quinoa, pickled ginger and various vegetables. Dinner main courses are hearty offerings; the triple-roasted free-range duck with Cointreau orange sauce is worth a return visit alone. The rich, creamy chicken-and-prawn curry encapsulates KwaZulu-Natal in each mouthful. Desserts are decadent, home-made treats, like liquid-centred chocolate pudding and classic crème brûlée. Otherwise end with a local cheese platter. This is a working bakery. Flours are all locally sourced, stone-ground and unbleached, and the breads are all hand-formed, slow-fermented and baked in an open oven. What results is bread from the gods. Expect to find a small selection of salads, toasties and pizza alongside pastries and bagels on the menu. Over the weekend, eggs Benedict or royale make an appearance. 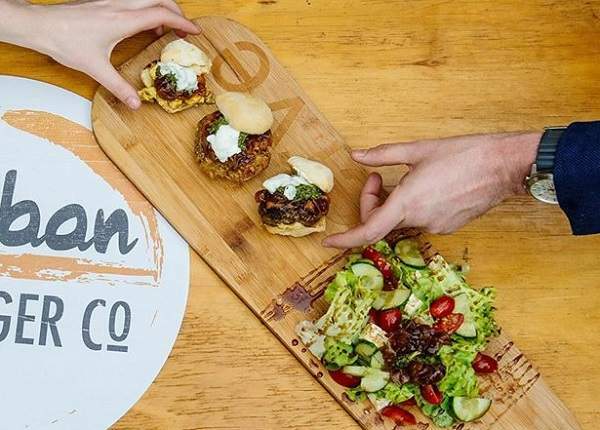 The Armenian lamb mince pizza comes dotted with minted yoghurt and herb salad; while the Spanish bocadillo features potato tortilla and chorizo on a ciabatta roll. End with a financier or home-made ice cream – the ginger-flavoured version is a triumph dotted with chunks of chewy ginger. Locally sourced artisanal produce and homemade products are transformed with a lot of love. 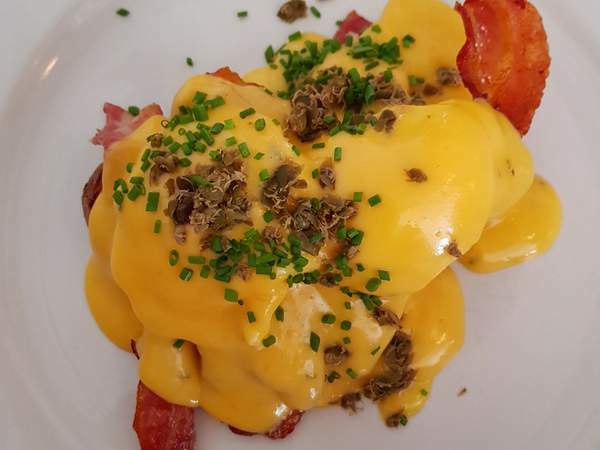 Try the clever Not-So-Benedict: perfectly poached eggs, a choice between mushrooms, bacon or wilted spinach with delicious lemon hollandaise sauce and capers on rye, ciabatta or potato-and-rosemary artisanal bread. If you’re lucky you could find a Benedict special that goes with a Bloody Mary cocktail. Or try the banana bread French toast with fresh banana, mango and lime curd with brown sugar, allspice crumble and ginger cream. Light meals include salads, soup and quiches of the day, as well as a vegan BLT option with braised butternut, and a chickpea curry roti wrap. For sweets there are cakes, muffins and scones. All-day breakfasts, burgers, pizzas and hotdogs. Tuck into eggs Benedict with salmon, tuna, mackerel, bacon, or ham with hollandaise. Healthier breakfasts include fruit salad, granola or muesli served with stewed fruit and thick Greek yoghurt. Get your seafood fix with either the marinara (squid, mussels, prawns and capers) or chorizo-and-prawn pizza cooked in the wood-fired oven. Dessert features piped doughnuts, chocolate mud pie, sticky toffee pud, Eton Mess and a Rocky Road ice cream filled with candied nuts and honeycomb. Focus falls on freshness and quality, and dishes embrace country life subtly with an eye for detail evident in the edible flowers. Subject to seasonal availability, the lunchtime menu includes pork steaks served with cauliflower couscous or home-made hake-and-salmon fishcakes. A firm favourite is the chicken-and-mushroom pie with creamed potato. New York baked cheesecake, lemon meringue pie and gluten-free chocolate-and-orange cake are true indulgences. Between March and September, Two Acres offers a high tea – a feast of sweet and savoury titbits including cloud-light scones, pastries, brûlées, tartlets and artisanal sandwiches to be enjoyed under the dappled light of indigenous trees. 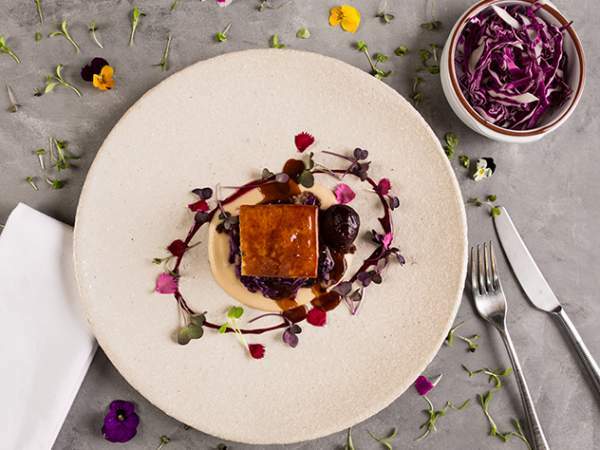 Chef Kayla-Ann Osborn, who was named the Eat Out Rising Star at the 2017 Eat Out Mercedes-Benz Restaurant Awards, crafts seasonal menus that utilise produce sourced from nearby, showing a profound understanding of flavour and meticulous technique. 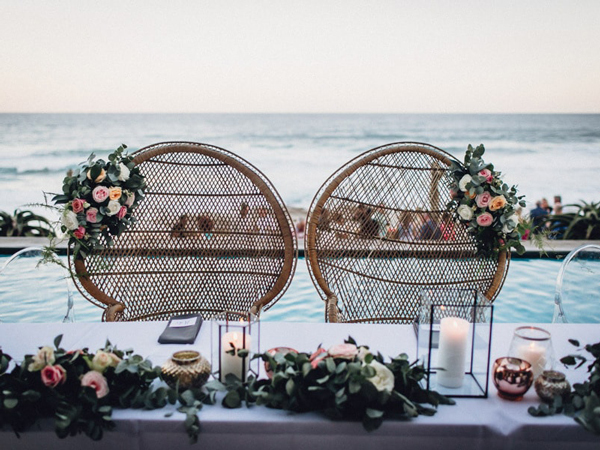 Inspired dishes might include sea-urchin risotto with preserved lemon, charred chive foam and parsley, or dune spinach and paneer ravioli with burnt butter and cashew paste. There’s also the popular chicken oysters with mushroom ravioli, wild mushroom, parmesan and jus. Desserts are delicately plated, well balanced and draw inspiration from a familiar childhood memory. One of Kayla-Ann Osborn’s dishes at The Chefs’ Table. Photo supplied. Start off with a spicy soup or salad and don’t forget the fresh breads, all prepared on-site in the tandoor. An array of vegetable, seafood, chicken and lamb curries is on offer in various degrees of heat. The usual vindaloo, madras, korma and jalfrezi dishes dominate the menu, and sides are ordered separately. The gajar halwa dessert certainly sounds interesting: grated carrot pudding cooked in thickened milk, enriched with nuts and fresh cream. Other options include the Bombay Crush and kulfi. The gobi Manchurian is sensational: cauliflower florets are deep fried and mixed with a gloriously sticky and spicy dressing. On the curry front, the tender chicken tikka masala is balanced with a good spice kick. If you’re after some serious heat, the lamb pepper fry in a dry-style gravy with green chilli and a generous helping of black pepper is just the ticket. Vegetarians are also taken care of with a satisfying palak paneer with a sweet-and-savoury spinach gravy and pleasing chunks of cheese. Sides include mountains of jeera rice tossed with cashews, garlicky naan or light-as-air paratha. For dessert, don’t miss out on the moreish sodji, a nostalgia-inducing bowl of sweet, warm semolina porridge with raisins and nuts. The breakfast buffet is unrivalled for its selection, with pancakes, oysters and hot classic dishes. The daily curry buffet is another gourmet feast, with at least 11 curries from which to choose. Executive chef Kevin Joseph lays out Singapore fish, chicken and prawn, butter chicken, beef vindaloo and traditional Durban lamb and sugar bean curries. These are served with basmati rice, dhal and braised butternut, and condiments like lime pickle and peanut-and-mint raita. The à la carte menu offers fishcakes, bobotie spring rolls, a pukka lamb curry sandwich, seafood platters, rich oxtail and a Durban bunny chow. Thin-based wood-fired pizzas and a wide-ranging sushi menu complete the options. Heavenly starters include melanzane parmigiana, trifolati (wild mushrooms sautéed in olive oil, garlic and parsley) and Patagonian calamari grilled with garlic and fresh lemon. Pasta dishes are rich: satisfying tomato, garlic and fresh herbs, or creamy white sauces. 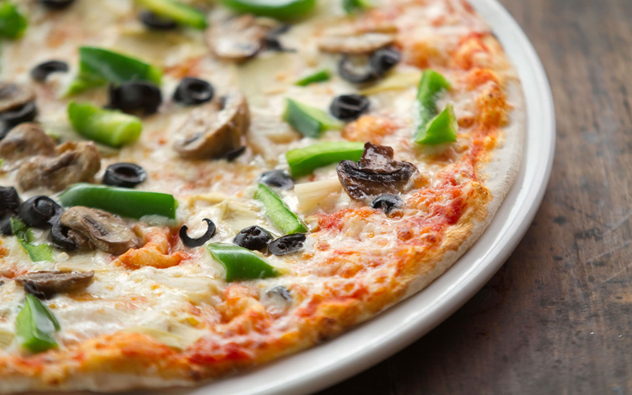 The pizzas are thin-based slices of pleasure – the dough is crisp and the toppings fresh. 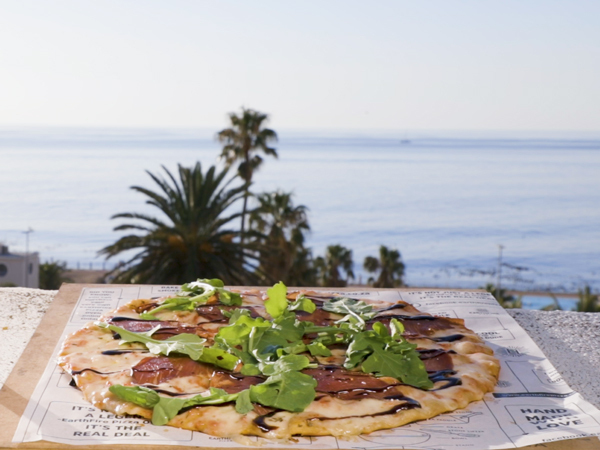 The Natal pizza, topped with ham, prawns, chilli and banana, pays homage to local cuisine. Fresh whole fish and seafood, baby chicken, veal and meat dishes round out the dining options. End with tiramisu or cassata. A pizza at Al Firenze. Photo courtesy of the restaurant. signature linguine de punto (pasta with calamari, prawns and mussels in a creamy sauce with chilli, garlic and white wine), seafood is king. Start with crab soup or calamari ripieni (baked calamari tubes stuffed with roasted red peppers, prawns and spinach, smothered in tomato and mozzarella). Non-seafood starter favourites are deep-fried olives stuffed with feta and melanzane alla parmigiana. Meat dishes include lamb shank, as well as a tasty rabbit casserole. End with smooth home-made panna cotta or tiramisu made by the owner’s mama. Antipasti entices, with options like crumbed olives stuffed with ricotta or Caprese salad with buffalo mozzarella. Have the asparagus al forno if it’s available. The rich dish comes bubbling with asparagus baked in a tomato-and-cream sauce and topped with mozzarella. For mains, the risotto con gamberi with plump prawns, tomato and cream is satisfying, or try the line fish cooked in the wood-fired oven. Pizzas are wood-fired and crisp, and pastas are home-made and comforting. The vast menu also features chicken and beef dishes that are equally pleasing. Finish with creamy panna cotta or light-as-air tiramisu. With home-made pasta and wood-fired pizza using only imported Italian flour (and a gluten-free option), Lupa offers an authentic food experience. Relish antipasti such as whole baked camembert wrapped in Parma ham, Falklands calamari or the rotolo of spinach, ricotta and mushrooms as a vegetarian option. Speciality pasta includes gnocchi, porcini panzerotti or vegetarian butternut-and-ricotta ravioli. For the red-meat lovers, there’s lamb shank, steak and veal. End with a delicious chocolate-and-caramel fondant with a salted-caramel centre and vanilla ice cream. The food here is relaxed Italian fare partnered with glorious baked treats and gelato. The broad menu ranges in everything from creamy scrambled eggs with house-cured salmon to Il Bosco Rosso (poached eggs with bacon, hollandaise and avocado). For lunch or early dinner, start with a spectacular deli board of imported cured meats and cheeses. Alternatively, order off the aperitivo-style street-food menu with delicious bites like polenta squares with pecorino cheese or marinated artichokes. Mains include silky pastas made in-house, as well as traditional wood-fired pizzas. Zio’s Pasta with cream, lemon, peas, prosciutto and mushrooms is completely indulgent, as is the to-the-tooth risotto ai funghi with mixed mushrooms and truffle oil. The seasonal menu boasts inventive dishes and exciting flavours. For starters, try the carpaccio, which delivers with tangy capers, artichokes and lemon oil, balanced by parmesan shavings and rocket. For a zingy taste, try the ginger-and-lime prawn tails with wasabi mayo. Mains such as plum-glazed duck breast on pancetta and pea risotto, drizzled with white truffle oil, hit the right comfort notes. The seared tuna in a mushroomy umami broth with bok choy and peanuts is a delight. End with a triple chocolate brownie with white chocolate and poppy-seed ice cream. The menu can be overwhelming, so order lots of little plates to share. 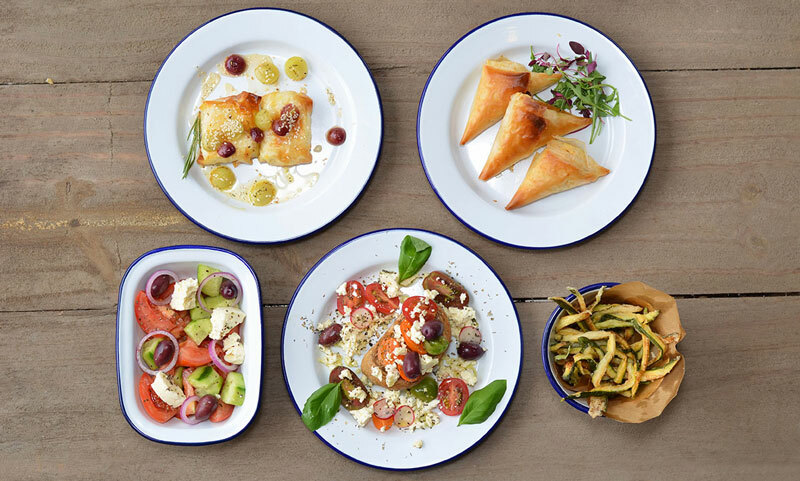 Mezze include fried halloumi, dolmades, spanakopita and falafel, as well as perfectly crisp zucchini fries. Fresh hummus is topped with pomegranate rubies, feta, red onion and pine kernels. It’s absolutely delicious. Bigger meals come in the form of pork, chicken or beef souvlaki. Lamb or pork chops are coal-grilled and can be ordered in single, half or full kilo portions. Leave room for dessert. The menu features traditional halva, either baked or served as ice cream, sweet sticky baklava and pavlova with Turkish delight and berries. The mezze at at NIKOS Coalgrill Greek. Photo supplied. This is a grand dining experience with Gueridon (trolley) service, where waiters prepare some menu items tableside, such as charcoal-grilled chateaubriand with flamed mushrooms in a rich Béarnaise sauce. A dish of prawns with burnt lime and a spicy habanero-and-coriander sauce is a delight. The Earl Grey smoked salmon is infinitely delicate, served with an unctuous truffle risotto, crisp bacon, parmesan tuille and a creamy white-wine sauce. The Oyster Box is renowned for its fine curries, and the selection includes a delicious butter chicken, KwaZulu-Natal lamb and Singaporean fish curry. Don’t skip the desserts: crêpes Suzette will be flambéed tableside, and the vanilla-bean-and-raspberry mousse with guava gel, sorbet and sugared rose petals is sublime. restaurant offers patrons the opportunity to interact with the chefs working behind the counters. The variety is astonishing: fresh mussels, plump prawns, perfectly trimmed calamari steaks and fresh fish are prepared in front of patrons and presented to their preference. The beef steaks and lamb chops are grilled while you wait and the roast meats are sliced on demand. The curry buffet features a biryani, vegetarian curry, mutton or lamb curry and sometimes a butter chicken curry. Rotis, sambals and various chutneys provide the full Indian food experience. The dessert table sees a chocolate fountain, trifle and gateaux. The Durban-inspired tapas and street-food offering here lends itself perfectly to beer-fuelled evenings. Kick things off with tapas like moreish deep-fried kalamata olives stuffed with ricotta, or lentil, chilli and feta samoosas with a minty yoghurt dip. Meat-eaters will enjoy sticky beer-braised chicken wings or the parmesan- and herb-crusted marrow bones. The vegan black-bean tacos with guacamole and tomato are a surprising hit, and the pulled pork or spicy chicken versions have a good kick of chilli. Other comforting mains include great gourmet burgers, mild butter-chicken bunnies, pork spare ribs, and an indulgent fried chicken waffle with bacon. End with waffles with home-made beer-and-honey ice cream and salted caramel praline. Sliders at S43. Photo supplied. The menu upholds its Portuguese roots, where freshness and consummate preparation skills highlight simplicity. Start with the house speciality of bacalhau assado – roasted codfish topped with olive oil, garlic and peppers. Mains heavily incorporate the sea: grilled fish, calamari, prawns, crayfish and langoustines served with lemon, garlic and peri-peri sauces. Platters and combos are life-saving choices. You can’t go wrong with a prego roll or espetada. Finish with dieta frita banana doce, which is a banana filled with chocolate, coated in coconut, deep fried and served with vanilla ice cream. Owner Frank Sykes is a Springbok fisherman, translating his passion into a commercial initiative that has swiftly become the neighbourhood’s go-to for knowledge and freshness. This restaurant is a hit for its seafood platters and vibey buzz. Fresh fish, shellfish, calamari and mussels accompanied by chips, salad or vegetables are the anchor dishes here. Specials change daily: the tuna ceviche of finely chopped tuna, red onions and tomatoes has in-the-know locals arriving in droves. Build your own platter or feast on a salad bursting with fresh ingredients. Desserts aren’t a feature; rather stick to a don pedro or Irish coffee. Start with three king prawns lightly battered with tempura. The tuna (or salmon) tartare is the perfect balance of zingy flavours. Other starters include grilled or deep-fried calamari, mussels steamed in white wine, or fish tacos topped with chilli mango salsa. Main courses include the usual line fish, shellfish and calamari dishes you’d expect, but don’t ignore the seafood curry bunny chow. The grilled East Coast sole is beautifully buttery and the tuna steak is wonderfully fresh and simple. A small menu of pasta, beef and chicken dishes caters to non-seafood lovers. Don’t miss the famous bread-and-butter pudding. While on the pricey side, the food here, with its emphasis on seafood, is worth it. Entrées include delicious choux pastry filled with spinach, Scottish smoked salmon and cottage cheese or sautéed mushrooms and prawns tossed in a light béchamel sauce. For mains, try the line fish of the day, baked and topped with a sauce of coconut milk and tomato. There are also grilled langoustines and prawn-and-chicken curry. Elegant desserts include classics like crème brûlée or crêpes Suzette. and a newly introduced Greek mezze menu with flame-grilled prawns, grilled artichokes, pickled octopus, freshly shucked oysters, mussels, calamari saganaki or fish keftedes. Flame-grilled calamari and chorizo is a start, or go for the sushi. Line fish such as dorado will come grilled in lemon butter, or Cajun spices served simply with chips and a side salad. If you’re up for it, go for one of the seafood platters heaving with prawns, crayfish, calamari, mussels and fish. Desserts are simple but delicious – affogato hits the spot. Everything is fresh and simple. 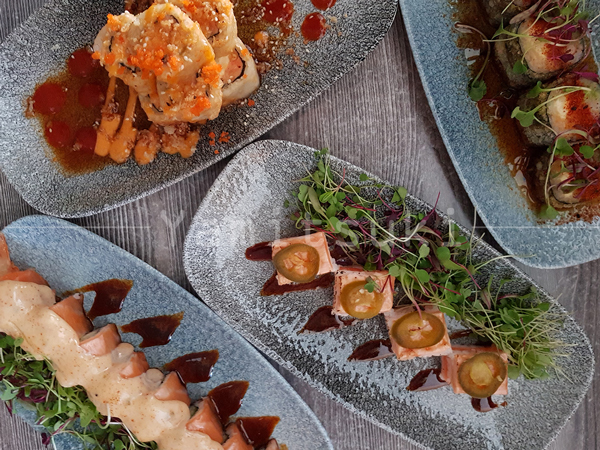 Kick off with sushi; mussels served in a fragrant Thai-style coconut sauce; or spicy and creamy peri-peri chicken livers. For mains, go for legendary fish and chips – battered hake with some of the best chunky chips around. Other highlights are grilled baby calamari and queen prawn combo; refreshing grilled dorado with garlic, chilli and pineapple; and pork loin ribs in a sticky and moreish secret sauce. It’s messy and satisfyingly so. If you have space, end on the sticky toffee pud. Big Easy is unequivocally South African in its meaty dominance. There’s the sheer scale of cuts and types presented, as well as the hearty incorporation of local spice and flavour. 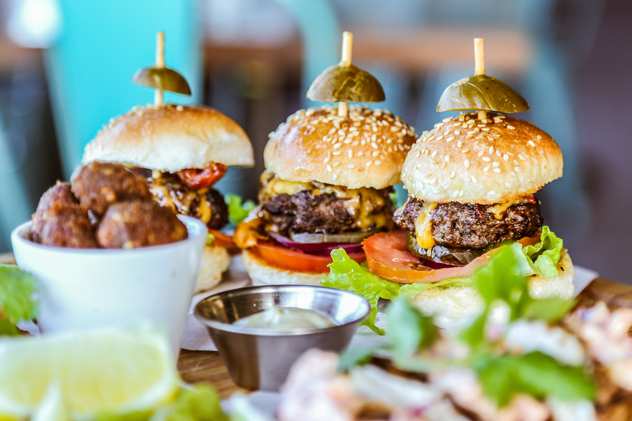 Meat aficionados relish starters like lamb three ways – masala-spiced lamb boerie with tomato relish, lamb shoulder fritters with apricot chutney, and lamb burger with cumin raita. Grill orders are a butcher block’s smorgasbord of premium-grade rump, sirloin and fillet steaks, pork and lamb ribs, lamb cutlets and chicken either as a peri-peri baby or a spice-rubbed breast. The butter Midlands duck is a showstopper: slow-roasted and served with cashew-nut butter curry sauce and traditional sambals, rice and roti. menu includes salads and tempting starters, but it’s dishes like the impressive fillet espetada that make this menu memorable. Finish with apple malva pudding. With a strong focus on meat, this menu showcases it in various forms, including a showdown between grain- and grass-fed, featuring a duo of beef rump in 200g portions, simply seasoned with Maldon salt, black pepper, thyme and mustard seeds. 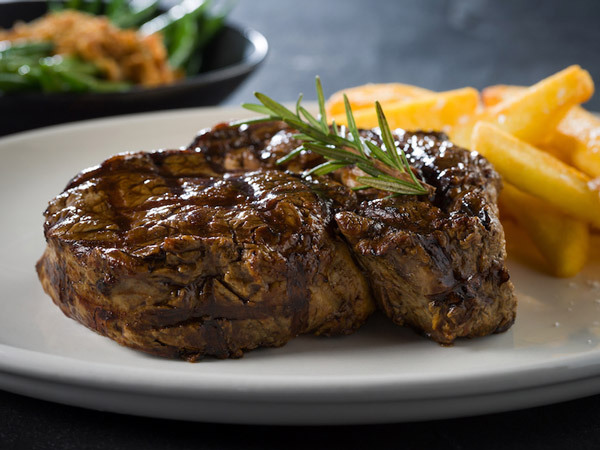 Other cuts include wet-aged fillet, sirloin and rib-eye, with dry-aged fillet on the bone and T-bone also available. Traditional steak tartare, garlicky snails or grilled Patagonian calamari are perfect starters. Line fish, seafood, chicken, pork, lamb and game round off a large menu. The pork belly with a bacon cider sauce is a delight. Finish with a perfectly flavoured crème brûlée. 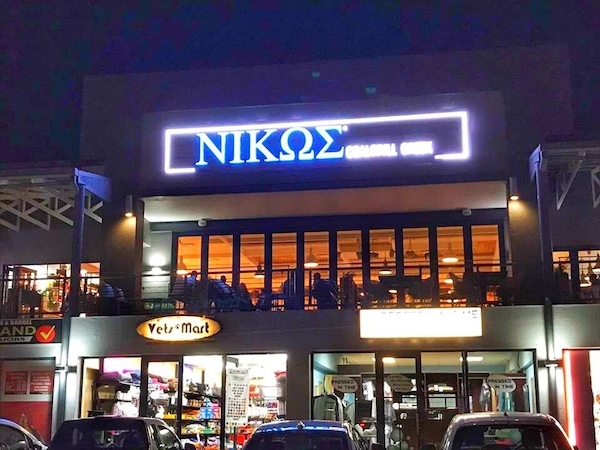 While the menu is limited, the food offers a modern and modified shisa nyama experience to add to the party vibe. The prawn tempura with Marie Rose sauce is a perfect start, but the surprise is the tasty grilled chicken roulade with Neapolitan sauce, baby broccoli and poached, grilled pears. Mains boast meat platters including chicken wings, boerewors, beef and lamb cutlets with sides like infused pap, chakalaka and jeqe (steamed bread). Alternatively, go for the herb-crusted lamb rack with creamy gorgonzola mash. The only dessert on the menu is a rooibos vanilla panna cotta. This selection comprises all the Durban restaurants that made the cut for the 2019 Eat Out 500, the list of best restaurants in the country as rated and reviewed by our panel of critics for the 2019 edition of Eat Out magazine (on sale now). But we know the city is crammed with loads more gems and mainstays that didn’t crack the nod. Please tell us about your favourites in the comments section below! SPIGA on Florida Road (Italian) a Durban institution and literally rocks the best spaghetti bollognaise in KZN…! FALAFEL FUNDI (Israeli) around the corner and just off Florida is simple dining,, but sensational, fresh, delicious, inexpensive food. SURF RIDERS CAFE (modern) on the beach promenade near the hospital: this busy, busy relaxed restaurant serves the most unbelievably delicious wood-fired whole fresh fish delivered daily by the fisherman. Only problem is when it’s sold, it’s sold, so to be sure, call ahead and reserve your fishes. Fab thin-crust pizza too and excellent service. Ocean Terrance should certainly not be on this list. During December 2016, I made a booking for my partner, my mother and myself. It was for my mother’s 70th birthday. I have been going to the Oyster Box, including the Ocean Terrace, for years and my mother since the hotel opened. My mother and I intended ordering the prawn curry, but had been to the OBH a few months earlier and the sauce was uncharacteristically chilli hot (not spicy hot like it should be and had been in the past). We mentioned this to the waiter, who arranged for us to taste the sauce. A nice gesture, but the sauce presented was like a bad arrabiata, and nothing like a curry. We decided to go with the pork belly. My partner had chosen the steak, medium rare. The meals came – (i) the sauce accompanying the pork was SO salty it was inedible, and the veggies were not al dente but were raw, with carrots going careering off the plate when you tried to cut them and (ii) the steak was medium to well done… We decided to send the food back and re-place our order, with my partner being the only willing one to allow them to retry the same meal. I ordered the chicken and my mum the shepard’s pie. By this stage, it was after 9pm… Intermittently, the managers came to attend to us, making all the right noises (it must be mentioned that the male manager on duty was intensely disingenuous). Our new order came out – (i) the chicken was dry and over cooked with a sauce that tasted somewhat like something out of a bottle (Nando’s does a better job of peri peri chicken), (ii) the shepard’s pie was too extremely dry (who thought you could get that wrong?) and (iii) whilst the steak was closer to medium rare, the accompanying spinach was so salty it was inedible. Clearly there is a huge issue in the kitchen at the moment! We decided to call it quits. We were brought complementary desserts of the managers’ choosing which was average and certainly didn’t go much in the way of redeeming the OBH. The manageress, Rose, took my details and promised that the food and beverage manager would call me… It is nearly a month later and still nothing. To add insult to injury, the waiter afforded himself a R90 extra tip by confusing what we had indicated. Since, I have chatted to a number of people who have had similar experiences. OBH, you have lost good patrons! Really Lauren, we all have good and bad experiences but your one personal experience doesnt reallty tell of the quality of the food. So much negative details! Also fish in umthlanga is the best fish restaurant by far in Durban. This list was looking great until I saw the Oyster Box. That place has given several diners the worse culinary experience ever! Over rated, over priced and does not live up to the supposed reputation. Oyster box is by far the worst food and absolutely no value for money. On 3 occassions I had said I would write them off due to poor service and awful food but kept giving them another try. For the food and service presented to diners, the price is not worth the experience. Shame on you! Fully agree with all the comments regarding Oyster Box Hotel restaurants. In no uncertain terms , the food is pathetic. Been there 4 x to give them a chance . Failed dismally. Ocean Basket is best for me and the prices are right for pensioners as well. Excellent service and the food is delicious. Agree with all the comments on The Oyster Box, had high Tea there & was SO disappointed, they clearly don’t have a Pastry Chef. Lupa Durban North have no idea how to cook spaghetti , I have experience a platter of spaghetti overcooked ( microwaved) and stock together, So much for a so call Italian restaurant. Generally poor kitchen standard, poor value for money, incompetent kitchen staff , for most of Durban so called restaurants. Palki on Musgrave road should be on your list of fairly good Indian restaurant. Running out of idea on where to go next. So the city with one of the largest Indian populations in the world gets 3 Indian restaurants on the list BUT 8 Italian restaurants??? Thanks for the bias Eatout…..
Another new rustic chilled vibe in westville is Turtle Cafe, located at 38 Pitlochry Road within a nursery down the road from Ukzn Westville. Fancy milkshakes, gourmet burgers, superb breakfast, excellent curries and bunnies are just some of the few good meals on the menu. This article needs to be edited and reposted. Sure all the places mentioned are well known and I’m certain we all have eaten at one of these restaurants. What about the others that were either forgotten about or nobody bothered to review. Prime example, the Asian/Thai inspired category? Siam in Umhlanga. I challenge you to review this place. The food is the most authentic taste of Thailand you will find in the entire KZN. Fresh and very healthy. I have eaten there numerous times and each time they have made my visit better than the last time. The other place is. Julios in Umhlanga under the Portuguese inspired. They have some of the most popular peri peri chicken and prawn combos. Please consider my suggestion. Thanks so much for the recommendations, Antonio!